It has been months since I have posted anything here and I have received a number of emails and comments asking if I am okay and why have I stopped writing. Back in 2006 when I started writing this blog, I was living and making my work in a studio on 96 acres in rural New York with two friends, four cats and a couple of dogs. The peace and quiet was wonderful but I was feeling a little isolated and was craving contact with my community. 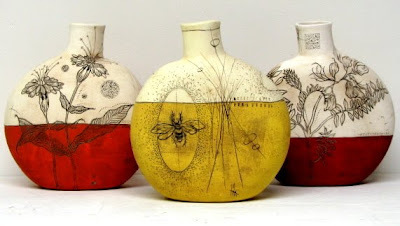 Blog writing on the subject of ceramics was still relatively novel and I had the time to write. It all just seemed to fit. Then I moved back to San Francisco, blog in hand, and continued to have a lot of fun writing. But about a year ago I started to lose steam. I am not certain why, but mainly I think there is a lifespan to these things. They are born out of need and when that need is met, new needs present themselves and what once was satisfying can start to feel like a chore. Then this summer, I made the cover of Ceramics Monthly and suddenly I felt like everyone was expecting me to say something more. I have received hundreds of emails since, asking me a multitude of questions, from show inquiries, to questions on how to run a small business to folks wanting me to share my process. And while this has brought many wonderful opportunities my way, it has also been a little overwhelming trying to keep up with all of it while trying to run a business. My immediate response was to want to hide. At my core, I can be a very shy person and having to act on demand is not something I do comfortably. Just ask my mom about this one. She couldn't get me to speak a word of Hungarian as a small child (I hated being the center of attention) but years later, on my own accord, I would move to Hungary and teach myself how to speak the language. I have a contrary nature that way. Frustrating, I am certain, to those who are close to me. I guess what I am saying is that the only way I can do this is if I feel compelled to. Unfortunately, I just haven't felt it. I can't do it simply because people want me to. It just doesn't fit with who I am. Also, I am in the process revamping my website and with this overhaul I intend to add a dynamic news/blog page but want to leave this open and am not yet certain how that will look. I am looking forward to a fresh start and perhaps something less focused on me and my work alone. Without question the writing of this blog has changed my life and has brought countless amazing people and opportunities my way. For this I am EXTREMELY grateful. for reading, your continued support and for all your kind comments along the way. I hope you will follow me into the future. I took my first pottery class in the eighth grade, not because I was interested in pottery but because a boy I had a crush on was taking the class. I remember making a clay hippopotamus in that class but I don’t remember what happened with the boy. 11 a.m. until 6 p.m. Please ask for permission before using my photos or content from this blog or my website. The photos and content of this blog are under copyright. All rights reserved.